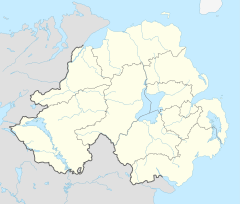 Hamiltonsbawn or Hamilton's Bawn is a village in County Armagh, Northern Ireland, five miles (8 km) east of Armagh. It lies within the Parish of Mullabrack and the Armagh City and District Council area. It had a population of 895 people (343 households) in the 2011 Census. The village is named after the fortified house with defended courtyard that was built by Scottish settler John Hamilton, brother of James Hamilton, 1st Viscount Claneboye, in 1619. By 1622 the lime and stone walls of this structure were 12 feet high and 90 feet long by 63 feet broad. It was destroyed during the 1641 Rebellion. The village of Newtownhamilton takes its name from Alexander Hamilton, a descendant of John Hamilton. Hamiltonsbawn railway station opened on 25 August 1864 and finally closed on 1 February 1933. The township of Hamiltonban in Adams County, Pennsylvania, was founded by a relative of John Hamilton in the mid-late 18th century, and named after Hamilton's Bawn. ^ "Hamiltonsbawn". Census 2011 Results. NI Statistics and Research Agency. Retrieved 22 April 2015. ^ "Hamiltonsbawn station" (PDF). Railscot - Irish Railways. Retrieved 2007-10-15. Wikimedia Commons has media related to Hamiltonsbawn. This page was last edited on 7 December 2017, at 11:20 (UTC).